George Nepia was the face of the legendary Invincibles team of 1924-25. The 19-year-old full back played in every one of the All Blacks matches on their tour of Britain, France and Canada where they won all 32 games. He scored 77 points on tour. Despite his impact - he was selected as one of the five players of the year by John Wisden's Rugby Football Almanack - and his youth, Nepia did not feature frequently in subsequent All Blacks teams. It is a travesty that as a Maori he was declared ineligible for the tour to South Africa in 1928 because of the Republic's apartheid regime. Nepia had natural speed and at 5ft 9in and 12st 13lbs he had an impressive physique for a back at that time. He started at fly half for Hawke's Bay but switched to full back where he impressed with his powerful kick, fierce defence and fearless tackling at the national trials and with the All Blacks in the northern hemisphere. Nepia, born in Wairoa, came from a rural background on the East Coast and was educated at Maori Agricultural College, a Mormon school where Erwin Moser, an American elder, taught him how to punt. Goalkicking, however was one area that was not considered his strongest. While on the tour of 1924-25 he kicked 31 conversions and four penalty goals but was the backup to Mark Nicholls. 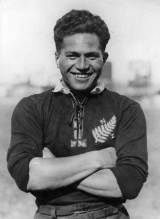 In fact, in Nepia's nine Test match career he scored five points - a conversion and penalty, scored against Australia in Sydney in 1929. He played a total of 46 games for the All Blacks, scoring 99 points with a solitary try, 38 conversions and five penalty goals. Nepia had intermittent involvement with the New Zealand team. Apart from not being allowed to tour South Africa in 1928, as a dairy farmer on the remote East Coast he missed the 1926-7 Maori tour to France, England, Wales, Australia, Ceylon (Sri Lanka) and British Columbia, because the selectors thought he was unavailable, yet apparently Nepia said otherwise. He competed in the full series against the British Isles who toured New Zealand in 1930 but did not score any points. Life got in the way of rugby during the early 1930s and Nepia suffered financial hardship during the Depression years. After captaining the New Zealand Maori team on a tour of Australia in 1935, he decided to switch codes, becoming a rugby converts when he accepted £500 to play for Streatham and Mitcham in England in the mid 30s. He later moved to Halifax. However the separation from his family - he had four children with wife Huinga - took its toll and he returned to play for Manukau. He was selected for New Zealand in 1937 and appeared in an international for the Kiwis in a 16-15 victory over Australia after New Zealand had trailled 15-6 at half-time. Nepia returned to the 15-man game after the Second World War when in 1947 an amnesty allowed players to switch back. He played for the Olympians Club against Poverty Bay - coincidently captained by his eldest son George - the only occasion when father and son have played against each other in a first-class match in New Zealand. In that match Nepia, in his 40s, also became the oldest New Zealander to play in a first-class game. Nepia continued his involvement in the game as a referee during the 1950s. He finished his playing career having featured in 129 first-class matches, 46 for the All Blacks, 24 for New Zealand Maori and 43 at provincial level for Hawke's Bay and East Coast. He was inducted to the New Zealand Sports Hall of Fame in 1990, four years after his death, aged 81, but his spirit lives on in every All Black - Maori or not - who has followed him.